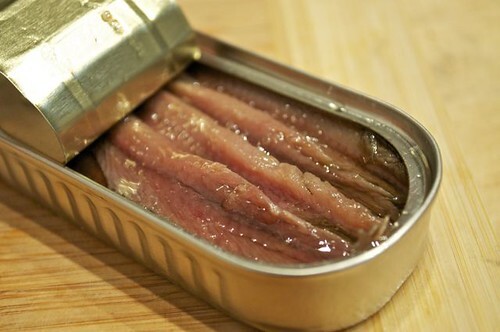 Poor anchovies – the mere mention of them is enough to make a grown man cringe. And if it does, it’s a grown man who’s a big sissy! Anchovies can brighten up many a dish far beyond a classic caesar salad. Once you make a pasta sauce with a couple of anchovies stirred in – they literally melt away and you wouldn’t even know they were there except for the fact that it is the best darn pasta sauce you’ve ever made – you too will realize that anchovies have made the short list of pantry items you simply cannot live without – they are stored in the fridge ( and that’s where you’ll find them at the grocery store) so you will never be caught without. Mash one part anchovy into 2 parts softened butter and see if your next serving of grilled fish or meat doesn’t do the happy dance. A swirl of olive oil, a little minced garlic, a couple of anchovies and then toss in your grilled, blanched or sautéed vegetables – sublime! And to make things even easier – it comes in a tube – like toothpaste – a little dab’ll do ya! And if you want the easiest and most impressive bite to bring to all those holiday gatherings over the next few weeks that comes together in a flash, say hello to this out-of-this-world anchovy spread – over crusty, toasted slices of rustic french bread, gourmet crackers or for a little twist, place a dollop over a small slice of provolone cheese – who’s cookin’ now?